Arsenal are reportedly in talks to seal the transfer of Sevilla midfielder Steven N’Zonzi in what could be a dream signing for Unai Emery in midfield. 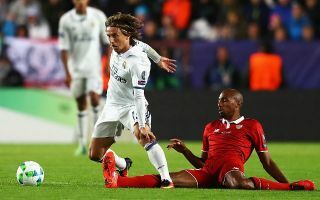 The Spanish tactician will know N’Zonzi well from his time in charge at Sevilla, and it seems the pair could be set for a reunion at the Emirates Stadium. Sky Sports claim the Gunners are in talks over signing the France international, who is currently at the World Cup in Russia. A tough tackler with a great engine, eye for a pass and in-game intelligence, N’Zonzi is an ideal all-rounder to give Arsenal the upgrade they need in the middle of the park. Jack Wilshere has just left north London after his contract expired, and the likes of Granit Xhaka and Mohamed Elneny are surely not good enough as long-term options. N’Zonzi seems perfect for Emery to continue the fine work he did at Sevilla with Arsenal and ensure the best possible start for him at the Emirates. It’s previously been reported by the Daily Mail that N’Zonzi wants out of Sevilla, having submitted a transfer request that could bring his asking price down to as little as £22million, though his release clause is £35m.